We recently stayed for 2 nights in the main house at Oak Gables with another couple and were thrilled to have the entire house to ourselves. The owner, Martha Scudder, was so welcoming and entertaining and made us feel right at home. She prepared a delicious breakfast each morning and even worked around our schedule so that we could catch an early ferry the day of our departure. The beds were comfy and the shower had excellent pressure that I wish we had at home. The Damariscotta river is visible from the beautiful property and there's a lovely pool to enjoy when the weather is warm (which unfortunately it wasn't when we visited). I stayed at Oak Gables for a weekend in July and loved it. Martha is a very kind and welcoming hostess, and I fell in love with her little dog Dickens. My room was clean and pretty and had a good air conditioner. Martha made sure I had gluten free items for breakfast, she made me special gluten free pancakes which were great. I didn't use the pool but other guests were enjoying it. I enjoyed talking with other guests and chatting with Martha in the afternoons for a bit. I hope I'll get back there. Dickens really enjoyed having you . You were very kind to take the time to write A REVIEW. It means so much to me when one appreciates my home.....and my Scottie too. This is why I can't retire. Dickens and I look forward to seeing you again. Oak Gables is set right on the Demariscotta River and it is hard to imagine a more perfect setting. We stayed in the main house in the Maple Room, which was beautifully furnished with antique furniture. Martha was an absolute delight and we enjoyed each morning's breakfasts and chats - a lovely way to start each day. Martha went out of her way to make our stay as lovely as possible. It is an easy walk into the little township where we found numerous excellent places to eat each night. We had a wonderful stay and would love to return. 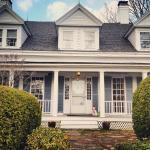 We stayed at the Oak Gables B&B one night and loved it! The owner and hostess is Martha, an older woman who loves to chat. That was fine with us! Dickens, the Scottish terrier, also enjoys the company. There are four rooms upstairs, decorated with wallpaper and antiques. It's an old house out of the mid-1800's (I can't remember the exact year), that is just gorgeous. The rooms share a bathroom at the end of the hall. There is also a livingroom downstairs with a tv as a common area, as well as the diningroom. The property has 15+ acres and sits on the river. There is a boathouse with a ping pong table and a very nice deck on the river. We sat there and saw a *seal* swim by!!! There is also a nice front porch for sitting. The home is close enough to walk to town. We enjoyed sitting on the deck and then the porch. We chatted with Martha. She enjoys telling jokes from past guests, so be sure to have some to share with her. She asked us what we would like for breakfast. My husband had French toast and I had scrambled eggs and toast (my favorite) plus we both had lovely, huge strawberries with powdered sugar. The stay was absolutely wonderful and we would go back in a heartbeat. Thank you, Martha, for such a lovely time at your lovely home. I picked out Oak Gables because of the swimming pool. As it happened, we were too early in the season - but to be honest, we really didn't miss it. 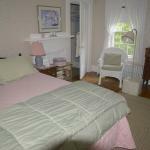 The house (and other accommodations) are set in lovely grounds, by the side of the Damariscotta River. Plenty of tranquility, birdsong - and conversation with Martha, the irrepressible owner, aided by Dickens, her four-legged side-kick. Our room was very comfortable. The shared bathroom might be a problem for some - it didn't bother us since we were the only people staying in the house at the time. All in all, a great place to relax. I stayed for 2 Weeks in the carriage house apartment . First time in Maine and couldn't ask for a more picturesque beautiful stay. The apartment was cozy and clean. Relaxing and quiet. Had washer and dryer too. U toured the bed and breakfast and wow I wanna stay there. It is adorable. The owner is so friendly and sweet and had my best of interest at heart. The town is so cozy and great for site seeing. Check out boothbay only 20 min away when there. ♡ I would highly recommend for anyone wanting the perfect Maine experience.